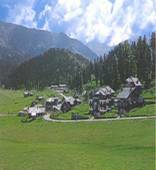 Gulmarg, which was initially called as Gaurimarg was renamed by Sultan Yusuf Shah in the 16th century. 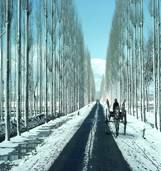 It is located in the located in the Baramulla district of Jammu and Kashmir at about 57 km southwest from the capital city of Srinagar.Gulmarg literally means'Meadow of Flowers' and is close to the Indo-Pakistan border. This popular tourist resort of the country has one of the highest golf course in the world, situated at an altitude of 2730 meters above sea level.Gulmarg is fully enclosed by forests of pine and deodar on all sides. It gives beautiful breathtaking sights both in Gulmarg and on the journey to this destination. Gulmarg one of the premier hill resort of the country was discovered in 1927 by the British. Sultan Yusuf Shah who got very much inspired by the grassy slopes and meadows with full of colourful and wild flowers gave its name Gulmarg.This is one on the best place in the for skiing. History says that even before British could discover this place Emperor Jehangir collected nearl 21 different varieties of flowers. This Shiva temple also known as Maharani temple situated in the centre of the Gulmarg town was once the royal temple of Dogra kings of Jammu and Kashmir. This temple historically referred as Mohineshwar Shivalalaya was built in 1915 by Mohini Bai Sisodhia, who was the wife of Kashmir Maharaja Hari Singh. The architecture of this temple is designed in such a way that it can be seen from all corners of Gulmarg.This temple is housed with the idols of Lord Shiva and Goddess Parvati.This temple is also one of the attractions of the tourist where it offers place for the visitors to sit and meditate amidst the mountains. The golf course in Gulmarg is one of the highest of its kind in the world. The place which is featured with a 18-hole golf course is nearly 100 years old. It has a golf club which offers the players a short term membership; otherwise they also have the option of hiring the golf sets. Apart from the members the even the tourists who visit this place on a payment of a fee are allowed to use the golf course. There is a clubhouse which portrays the old Swiss style and culture is seen within the course. 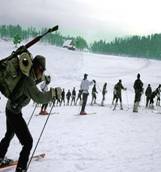 Gulmarg has few of the highest and best skis in India varying about 8,700 to 10,500 feet. For people who love adventure this is one of the best places to visit especially during the months of November to February. There are both small and big ski runs which ranges from 200mts to 3kms which can be used both by the beginners and intermediate skiers. All the stuff and equipments required for skiing like sticks, snow boots, woolen socks, mufflers, windproof jackets, goggles and caps are available in the town. 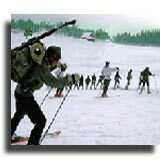 You have the option of either buying it or hiring these skiing equipments. You need not to worry of who will assist you for there are instructors. People who do not want to take the risk of adventures can enjoy with the ski lifts and chair lifts. Now with the development of cable cars you have the opportunity of going high to the top of Apharwat peak and from there skiing down which takes about nearly half an hour. Apart from skiing there are other winter sports like snow scooters and snow bobbing. Though this cable car was initially developed to carry the skier’s uphill, now it has become one of the main attractions of the tourists for its jolly ride. This Gondola cable car gives you an adventure of going above to atleast 15,000 feet high. This gives you a feel of getting into the clouds. 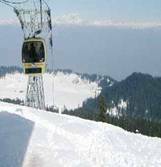 The corporation of Gulmarg cable car offers you a very good and safe service. 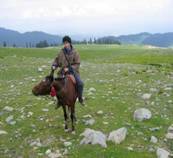 Horse riding in the open valleys and in the green meadows is another prime attraction for the tourists. There are horses and ponies available for all age group of people where you can take a ride amidst the nature. Nanga Parbat with the help of local guides who takes you in the right and safe route. 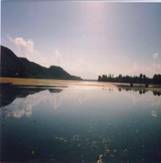 A long walk in the nature not only gives you a peace of mind but also it is very good to keep your health fit. Looking down the valley gives you a complete view of Srinagar. Khilanmarg which takes about 2 to 3 hours either on a horse or by walk is one of the famous areas for skiing. From here one can get to see and enjoy the views of the Kashmir valley and the Himalayan range. This lake which is situated at about 13kms from Gulmarg is near the Apharwat peak. 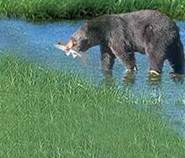 if your visit is during the months of summer you can see the rustling water. 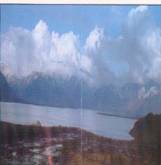 Wular lake is one of the second largest fresh water lake in the country situated at the foothills of the Haramuk Mountain. This is situated in the Sangrama which lies in the Baramula Road. The sunset and sunrise is a beautiful sight to be witnessed here. The Manasbal lake which just a few kilometers away from the Wular lake is known for its lotus blossoms. The Gulmarg biosphere reserve is located at a distance of 48 kilometers from Srinagar and offers one of the most attractive wildlife tour and travel packages. 4. Global Hotel/Restaurant(western food)-close to the bus station. You have nothing much or specific to shop in Gulmarg other than the woolen items which is available in the pavement shops and small stores. 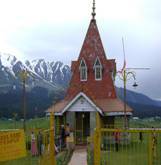 The closest train station to Gulmarg is Jammu from where you can a hire a taxi or a cab. Jammu is connected to major cities in the North India by the rail route. The government of Jammu and Kashmir has got a well maintained good metalled ghat roads in the mountainous region.Gulmarg has a good road connection to Srinagar which s connected to major cities in northern India. It takes about 2-3 hours of drive from Srinagar to Gulmarg.Apart from there are state transport buses to Gulmarg.